I am down to my very last regular copy of “Tobiko”, so if you are thinking about buying one now is the time! Edition of 56 (including 5 special editions), signed and numbered, 31 x 23 cm, French fold, hand bound with Japanese stab binding, digitally printed on 150 g Profimatt. Comes with a map in Japanese. Posted in books, photos, travel | Tagged book, Japan, Tobiko | Comments Off on Last call! At my printer today: Because of the French fold aka Japanese binding I had to assemble the folded pages for “Tobiko” manually. No idea how the big publishing houses do this. 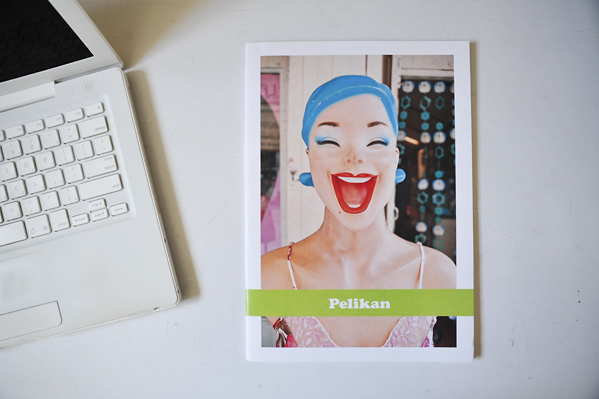 My book “Pelikan” is now in the Indie Photobook Library. Thanks Larissa! Still a few copies left! More info here. I am very happy that after being shortlisted for this year’s Dummy Award of the 5th International Fotobook Festival my “Pelikan” book has now been selected by Photobookshow to be shown at Book Show D hosted by the Finnish Museum of Photography in Helsinki from August 31 till September 2!